Many of us are nostalgic for the days of the reverse chronological newsfeed—the good days when liking someone’s post would earn you their follow, comments poured in and your growth felt sizable week over week. These days, that is no longer the case. Instagram’s now saturated user base has made it a battlefield for viewer’s attention, where content is our weapon and engagement is our prize. As business owners and marketers, it can sometimes feel like we’re fighting an uphill battle– working each Instagram update to grow and capture our audience’s attention. Well, we come bearing good news: Instagram finally listened to our pleas. Well, sort of. Rather than fully going back to the chronological newsfeed, they created an algorithmic compromise that considers three factors. In an interview with TechCrunch, Instagram’s product lead Julian Gutman breaks down their algorithm. Timeliness: There’s the magic word! The algorithm takes the recency of a post into consideration of where it appears on your newsfeed, prioritizing more recent posts over something that was shared a few days or even a few weeks ago. Tips for how to proceed: To work with their algorithm, post consistently. Gutman also spent some time talking about which common Instagram rumors are not true. For example, shadowbanning, or hiding posts with certain hashtags, does not exist. They also shared that Instagram’s algorithm does not downrank accounts that post too often. That being said, you still don’t want to spam your followers with too many posts at one time. Pro-tip: Scheduling your posts in advance is a great way to stay timely on Instagram. We use Planoly for this. Relationship: Instagram prioritizes accounts you interact with more through liking, commenting, tagging photos, etc. Their goal is that you don’t miss your friends and family’s posts! In order to engage your followers, build a relationship with them. Especially when first growing your account, relationships are a two-way street. The more that you are liking and commenting on others’ posts, the more often your account’s name is appearing in front of others, too. Tips for how to proceed: Later had the great idea of encouraging your users to tag your account in their post. Since tagged photos are included in Instagram’s relationship algorithm, it could have you appear higher in those users’ newsfeed. Giveaways using user generated content is a great way to build relationships with your followers and encourage tagged posts. Also, incorporate CTA’s into your caption. Interest: Instagram predicts what accounts you are most interested through three main signals. How frequently you open Instagram. The algorithm is created to show you the best post given the last time you opened Instagram. How many people you follow. The more people you follow means a greater amount of posts to choose from. How long you spend on Instagram. The more time you spend on the app, the more posts you’ll see. If you are a little surprised about the above, well join the club! Instagram shared that like Facebook, the growth of users, content and advertising content has accounted for the decline of reach. For example, imagine that the beginning of Instagram was like trying to locate your friend in a crowd of 10 people. You’ll spot them with ease. What about a crowd of 100 people? Now try to find them in a crowd of 800 million people because that is how many monthly users Instagram has as of September 2017. According to Instagram, users missed 70% of their friends’ posts with the chronological newsfeed. Posts now reach 50% more users than with the chronological newsfeed. 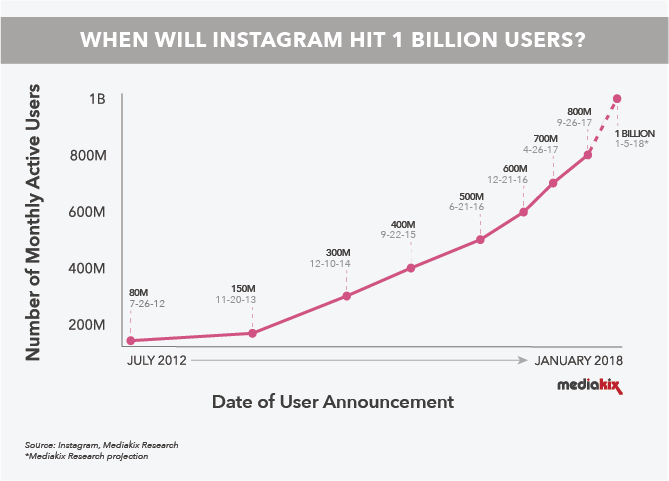 While it’s easy to think it’s the algorithm that’s hurting your engagement or your growth rate, the reality of the situation is that there are more users on Instagram now than ever before all competing for attention. At Citrine Marketing, we’re always keeping an eye on the latest Instagram updates and how to incorporate them into your social media strategy. Stay tuned. As the marketing coordinator, Carolyn works with clients to ensure that their vision is seen across all channels. Her dedication to the client is reflected in her work. When she’s not at her desk, you can find her out in nature.